86 comments to Does the PDO drive global temps, and is there a Siberian connection? Gosh. A colder ocean makes colder air and a warmer ocean makes warmer air. Who would have thought that would be the case? Gee, I don’t know except maybe for someone who has been on both the west cost of central California an “enjoyed” the cold breezes off a cold East Pacific Ocean. Then at another time been on the west cost of central Florida and who enjoyed the warm breezes off of the waters of the warm Gulf of Mexico. Yes Lionel you are right, and gosh, isn’t it wonderful we have minds like Frank Lansner to wonder about the mix of those two climate products. Gee Lionell, do you think it’s the ocean temp’s that control the air temp or is it the air temp that warms and cools the oceans. Whatever we both know co2 aint the main cause. That agrees with my experience living near the coast of California. La Niña: cold and dry, lots of freezing nights in the winter. El Niño: warmer and a lot of rain, few or no freezing nights. 2) a general change og global temperatures given the “amount” of heat in a nino3,4 variation. Its kind of 2 paradigms, and the graph on fig 1 shows that the second is likely the most true statement. So yes, air temperatures changes due to change in certain ocena temperatures, but in what way? thats the question. There are people that are “dissapointed” because recent La Ninas cannot reach same low temperatures than La Ninas decades ago. But as fig 1 shows, this would demand a quite extraordinare La Nina. Cooling demands a period with more La Ninas than El Ninos. … .. or so it seems. It is still the case that when the ocean is cool the atmosphere is cooled. Then when the ocean temperature cycles to warm, the atmosphere is warmed. Clearly, the ocean temperature rules. What rules the ocean temperatures? That is the 64 trillion dollar question not yet answered. However a monotonically increasing atmospheric CO2 concentration clearly has a substantially less effect than the cycling ocean to the point of being undetectable. That is, without cooking the data beyond all connection with reality and using the output of various incomplete simulations as if they were actual data. Well, for the areas Siberia and Nino3,4 that show some tendency to be connected, its most likely that Siberian shifting snow cover can drive a temperature due to albedo. Thus Siberia may be quite a climate driver as described in the article. And then the 29000000000 $ Question: What drives changes in Siberia Snow cover? Moist and temperature? But even though more appears known, we still dont know much. However, to get nearer some final explanations, you need to dig and dig. However, fig1 – in my view – is certainly useful knowledge, if true for example, the recent Rahmstorf and Foster “real temperature graph” where they “adjust” for nino3,4 is nonsense if fig1 holds any truth. Fig1 strongly indicates, that the effect of a La Nina or El Nino is not limited to the years they occur. No they seem to have a general lift or lowering global temperature level, and thus a “correcting” just focusin on the very year El Nino/La Ninas occurs is nonsense. As a layperson struggling to understand this, isn’t the first principle here that the PDO is one of the cycles driven by physics of the thermodynamic demand for the Earth to strive toward temperature equilibrium between the incoming and outgoing heat? So maybe we can envision the PDO as a conveyer belt for heat leading from the bottom of the Pacific to outer space? And since the system as a whole can never reach equilibrium because of the infinite complexity of the planet – continental shapes, ocean basins, life, solar and cosmic energy variable, clouds, dust, gases, volcanoes, tectonics, tides, orbital variation and a hundred other things, what we have is an extremely nonlinear system of cycles, epicycles and fractal eddies held in place by various kinds of slowly evolving attractors. So to ask what drives Siberia snow cover will only beg the question what drives the driver of Siberian snow cover and so on until we come full circle to whatever Siberia snow cover is driving. But to do this one would have to consider the whole global system, not just the Pacific. Still, it does seem that at least some scientists believe they know enough about PDO shifts to have a predictive value. Addressing the Washington Policymakers in Seattle, WA, Dr. Don Easterbrook said that shifting of the Pacific Decadal Oscillation (PDO) from its warm mode to its cool mode virtually assures global cooling for the next 25-30 years and means that the global warming of the past 30 years is over. The announcement by NASA that the (PDO) had shifted from its warm mode to its cool mode (Fig. 1) is right on schedule as predicted by past climate and PDO changes (Easterbrook, 2001, 2006, 2007) and is not an oddity superimposed upon and masking the predicted severe warming by the IPCC. This has significant implications for the future and indicates that the IPCC climate models were wrong in their prediction of global temperatures soaring 1°F per decade for the rest of the century. The very essence of a narrative that suggests climatic effects from changes in .009% of a planetary body’s atmosphere can lead to runaway catastrophes is not even in the realms of sci-fi. It is an embarrassment to the combined intellect of humans that we postulate such crap in the face of overwhelming historical evidence that we see ourselves as extraterrestrial to the universe. … we can envision the PDO as a conveyer belt for heat leading from the bottom of the Pacific to outer space? I am not sure if that works Wes. I was under the impression that the water gets colder the deeper you go. So I don’t think it is the “heat rising” that causes the cyclic upwelling currents, it has to be something else – a lowering of atmospheric pressure perhaps? I agree with the conveyor analogy. I suggest the conveyor itself powered by moon and rotational induced forces, as well as thermal. The Coriolis effect also comes to mind. I’d speculate that the thermal motion is driven more by the cold polar waters sinking than warm water rising. This is why (I reason) that diminished arctic ice is actually not a sign of global warming but instead a sign (or cause) of global cooling. Thank you Frank for your tireless efforts to find the true climate drivers. Ironically if the great CO2 scam had not been perpetrated much of what we now know about climate and it’s causes would still be unresearched. The Manns and Joneses have through their manipulation of data and unscientific methods have actually caused you and others to pursue the facts and eventually that will be recognised as a great service to mankind. Well done. Also, further to Wes’ thoughts above. Regardless of what external (doubtless predominantly solar and planetary) drivers dictate PDO, AO, ENSO, etc., surely these oscillations are merely manifestations of the convective forces of the planet in redistributing heat. If the IPCC is even remotely correct, and CO2 is contributing in some way toward the increased radiative forcings contributing to global temperature rise, then “correcting” for these factors would be completely incorrect scientific methodology- “nonsense” as you say- because necessarily it would over-emphasize the radiative effects on the planet’s heat budget, thereby promoting erroneous and artificially high climate sensitivity to CO2 by negating natural negative feedback convective mechanisms that these effects promulgate. How can anyone (the IPCC for example) therefore make remotely accurate predictions of the effects of these said radiative forcings by adjusting out any counteracting compensatory mechanisms? That would explain why their “scenarios” have no predictive ability, because they nullify any negative feedbacks by effectively arbitrarily assigning them as zero. Hi Winston and thankyou for comment! You know, that is to some degree my opinion too. After working with Siberian temperatures, snow cover and then Pacific temperatures, I end up with the impression that the large oceans appear to be more like passive mediums just distributing heat. Or more precisely, It is af if this 30-year PDO oscillation is not really showing some heat revealed in up to 30 years that then enters the atmosphere. I get the impression that yes, heat can be hidden a few years max under ocean surface, and that real drivers are mostly albedo driven (Clouds, snow and ice cover). Further to thoughts re the oceans- Given the relatively small rises in atmospheric temperature attributable to CO2, how can the vast oceans, covering 70% of the planet and to great depth in vast areas, be able to be”heated” to any significant degree by the dynamics of GHGs, even allowing for the effect as consensus science suggests? Surely the solar dynamics are the only force powerful enough to warm the cold depths of the oceans to any significant degree over any decadal or longer timescale. Surely convection via ocean currents with the poleward movement of equatorial warm waters plus transfer of heat in depth against the gradient of the thermocline, plus melting of arctic sea ice, plus increased evaporation of surface water, along with extra “work” dissipating the heat with stronger and swifter movement via these currents would dwarf any significant heating that could possibly occur to the oceans themselves to any significant depth. To me, this idea of increased atmospheric heat content from “back-radiation” from GHGs significantly warming the oceans seems akin to putting out a bushfire with a spray bottle of H2O. Right general idea, but hopelessly inadequate in scale to manifest any significant alterations in the overall scheme of things. Am I wrong to suggest this? I’d welcome you thoughts. Imo the oceans cooled from higher temperatures long ago. Higher temps due to eg. when the crust was much thinner, heating from the hot core, the latest big meteor or whatever. (ocean floor is about 5 – 10KM thick, temperature difference ~400K between top and bottom). Presently the earth system (hot core, crust, oceans, atmosphere) are in radiative balance with incoming solar radiation, so no change of the total heat energy in the system. This means that the oceans (70% area) have a “base” temp of ~275K. Only thing solar radiation has to do is heat the ocean surface to the average ocean surface temp (290K ?). You’ll find the solar heated ocean water above the thermocline, relatively deep in the tropics, surfacing near the polar circles. So imo the GHE (heating surfaces temp from 255K to 288K) is totally unneccessary to explain our current tempratures. 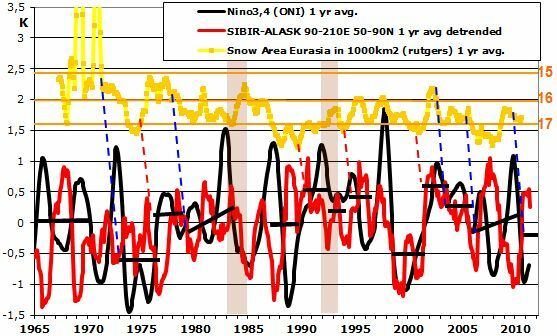 “”Well, for the areas Siberia and Nino3,4 that show some tendency to be connected, its most likely that Siberian shifting snow cover can drive a temperature due to albedo. Thus Siberia may be quite a climate driver as described in the article. And then the 29000000000 $ Question: What drives changes in Siberia Snow cover”"? I’ll have a stab, although you have already elucidated to the answer in you statement, “In fact, the relationship on fig1. seems to confirm that periods of numerous La Ninas cools the planet and periods of numerous El Ninos warms the planet. Numerous La Nina occur during cold PDO, and numerous El Ninos occur during warm PDO, and thus fig1 – if true – confirms that cold PDO cools the planet and warm PDO warms the planet”. “So perhaps heat collected in the Nino3,4 area from the pacific is not only reflecting some passive oscillation of heat, no, it may also reflect the newly produced heat from Siberia (and possibly other areas), which would then make Siberia be an important climate driver”. The key is in the distribution of OHC in the lower western pacific during La Nina’s. Don’t forget what happens during La Nina systems, the upwelling across the the lower eastern pacific into SPAC is plugged. Some of the OHC from dissipated from El Nino during La Nina ends up in the Atlantic during La Nina and the resultant effects upon Eastern and Western Europe’s humidity and SIBERA’s SNOW COVER. Just put the money in the hat, thanks. PS I don’t like the term La Nina, it is not an opposing system to the dominate El Nino. No, the paths of creating a quantum of heat reaching the Nino3,4 area need not allways be exactly the same as the path of cold reaching the nino3,4 area. But it would seem as whereever the heat /cold enters the Nnino3,4 area originates from, the amount of cold/heat seems to count just the same. I swim on the East Coast of Australia and like a dog in a Earthquake I know 6 months out from a breaking drought. I use a simple method of deduction. When early spring waters are cooler than the year before rains and La Nina are not far off. Probably because of the first law of thermodynamics, those warm SPAC waters of El Nino eventually find their way to my home. - So, its the SPAC – cold that will get you! Thankyou Frank. This is the type of thing I need to read eight times before it all sinks in. Surely that makes both 1 and 2 partly correct. While the albedo of Siberian snow would have a huge effect “Siberian air temperatures influences Nino3,4 temperatures with a 15-18 months lag and vice versa.” it is not going to be a quickly global effect. Any direct change in the flow of the oceans caused by the magnetic effects on electrical “earth” currents in conductive salt water would cause a larger shift from normal via a solar cycle driven small change in the paths taken by warm and cool water. This also does not suffer from Rereke Whakaaros endless cycle of blame problem. Surely the total heat of the oceans is a balance between the planet it is sitting on and the external heat gain/loss not just the oceans counted on their own as the heat reservoir. The atmosphere with very little thermal mass would just follow along. The water in the pot on the stove is more effected by the heat source under than the light over. Our ‘stove top’ may not have much of a heat source of it’s own but does have a very large thermal mass. So a change in the way the ocean gives heat to it or takes it away will take time and therefore multiple El Nino or La Nina sequences to effect a small slow long term shift in the balance. If this is driven magnetically by the solar cycles pushing the flow of the oceans left and right against an electrical current in the water that is also influenced by the solar wind, then it is again all down to the sun. The above all seems good except for the simple question: Why is the middle of the earth hotter than the average deep ocean temperature? “SURFACE waters are flushed regularly, even in lakes. Twice a year they sink, carrying their load of atmospheric gases downward. That’s because water density changes with temperature. Water is densest at about 39°F (a typical refrigerator setting — anything that you take out of the refrigerator, whether you place it on the kitchen counter or move it to the freezer, is going to expand a little). A lake surface cooling down in the autumn will eventually sink into the less-dense-because-warmer waters below, mixing things up. Seawater is more complicated, because salt content also helps to determine whether water floats or sinks. Water that evaporates leaves its salt behind; the resulting saltier water is heavier and thus sinks. Oceans are not well mixed at any time. Like a half-beaten cake mix, with strands of egg still visible, the ocean has a lot of blobs and streams within it. When there has been a lot of evaporation, surface waters are saltier than usual. Sometimes they sink to considerable depths without mixing. The Mediterranean waters flowing out of the bottom of the Strait of Gibraltar into the Atlantic Ocean are about 10 percent saltier than the ocean’s average, and so they sink into the depths of the Atlantic. A nice little Amazon-sized waterfall flows over the ridge that connects Spain with Morocco, 800 feet below the surface of the strait. Another underwater ridge line stretches from Greenland to Iceland and on to the Faeroe Islands and Scotland. It, too, has a salty waterfall, which pours the hypersaline bottom waters of the Nordic Seas (the Greenland Sea and the Norwegian Sea) south into the lower levels of the North Atlantic Ocean. This salty waterfall is more like thirty Amazon Rivers combined. Why does it exist? The cold, dry winds blowing eastward off Canada evaporate the surface waters of the North Atlantic Current, and leave behind all their salt. In late winter the heavy surface waters sink en masse. These blobs, pushed down by annual repetitions of these late-winter events, flow south, down near the bottom of the Atlantic. The same thing happens in the Labrador Sea between Canada and the southern tip of Greenland. I do not necessarily agree with every statement in this website. Just want to say thankyou for a really interesting writing, – now I know who to ask concerning sinking waters etc! I can’t understand it. I can’t even understand the people who can understand it.” — Queen Juliana of the Netherlands. I know that’s a tongue-in-cheek remark. So this isn’t a criticism, just an opportunity to say the following. I can understand it enough to get a good general picture, thanks to people like Frank Lansner and so many others. The main reason I keep reading JoanneNova is the opportunity to rub elbows with all those people I can learn from. So I owe a thank you not only to Frank but to all of you who contribute and debate. The best linear fit of the data points of the last decade displays a fairly strong cooling of 1.8°F. Recent cooling has also been observed in other parts of the world, and some climatologists have attributed this trend to the low solar activity we have experienced over the last few years. Another symptom of this can be seen in the aurora activity, which has decreased over the few last years here in Fairbanks. It is worthwhile to point out that during the Maunder Minimum (1645-1715), a time period of very low solar activity, Greenland froze over and the Vikings had to leave, as agricultural activities became more difficult. Latest monthly summary for 2011. In Fairbanks the average temperature was -8.2°F, a very substantial negative deviation (-10.8°F) from the November’s long term mean. This discontinues the above normal temperatures that had been observed in September and October. The high temperature for the month was 25°F on the 4th of November, while the lowest temperature occurred on the 17th with a low of -41°F. Remarkable was the cold spell from the 15th to the 22nd November with low temperatures daily of -35°F or below. Six days of the week set new daily record lows. These temperatures were more typical in the 1960′s, and four of those six broke records that had been set in 1969. Further, it was the 6th coldest November recorded in Fairbanks and this dataset exceeds a century in length. “”From the black Nino3,4 peaks to red SISBIR_ALASK peaks fig 4, heat seems to shift location like the stone of a pendulum. Heat from the Nino3,4 can normally be found mostly all over the world. However, it seems that the heat “coming back” from just a smaller area (Siberia + SPAC etc.) often seems to generate a heat peak similar to the previous heat peak… That is, even though heat is distributed to the whole globe, the following peak appears to have the same quantum of heat”". Consider the earth a planetary body in a vacuum. It’s physical characteristics,(molecule construction)controls its mechanisms for radiative emissions to space, just like our Sun. Although the sun obtains its energy by nuclear, nevertheless it emits it’s surplus energy by radiation, just like our earth. You’ll notice, at times, the sun has a cluster of energy emissions we call sun spots. An good analogy, for the earth would be to consider our sun spots as a El Nino, and its accumulation of such energy though oscillation eg, AO, La Ninas, etc. Changing the molecular construction will change our climate eg, Venus. We are not changing the molecular construction of Earth by introducing anthropogenic Co2. It is unclear if human Co2 can change the oscillation lapse rate, however, oscillation is ultimately driven by the oceans and the effect of Co2 there is negligible, totally swamped by H2O. Nice analogy with sun spots and Ninos there Markus. Full marks (no pun intended) for ‘outside of the box’ thinking there mate. I see Roy Hogue is on to it – getting the squiggle above the ‘n’ in La Nina and El Nino. Although it doesn’t seem to work (for me) in these comments, it does in other programs, and it may be of use to you if you knew how to do it, too. Hold down the CTRL & SHIFT then push the ‘~’ key, then hit ‘n’ after letting the other keys go, and there you are. La Niña and El Niño. Ahaa! But if you do it in a word (in MS Word) that needs it like Niño, it works. ‘Darn’ doesn’t need the thing so it disappears when you hit space or enter. Anyway, wasn’t trying to waste your time. FijiDave, not at all, it’s not a waste of time. I’d like to get these right. Shame the wordpress comments and editor machine doesn’t do it properly. I’ve tried to fix the post. Jo-san: ñ can be entered with [ALT]0241 from any PC with a Num Pad. The number key row won’t work. Most laptops require toggling the keyboard Num Pad before you can do it. Apple products won’t do this at all, but see the instructions. Copy/paste away and forget the stoopid shortcuts that nobody can ever remember anyway. One for your bookmarks folder. I cheated a bit. I’m a very bad typist, fingers tremble pretty badly. I joke about being like lightning on the keyboard — I never strike twice in the same place. So I put what I post through the Word spell checker. Lo and behold it gave me the accented character without having to do anything. I just pasted it into the box and posted it. The Word 2003 that I have doesn’t list a key combination for the accent that I can find. Sorry, no magic silver bullet. It was an accident of circumstances. These Microsoft elves are very clever. I was surprised that the Spanish word was even recognized. I was surprised that the Spanish word was even recognized. But see below. I’ve been programming computers too long and they just don’t like me. After thinking about it I tried again. I wasn’t able to repeat that behavior. I had typed my comment into the entry box, copied and pasted it into Word and I got the accent. A second attempt didn’t do it…and they say computers are deterministic and do the same thing every time. Don’t believe it. In any case Ctrl + Shift then ~ followed by n does give you the accent in word, as in El Niño. In Windows, Do Start, All Programs, Accessories, System Tools, Character Map. Click on the character you want, then read the lower right corner of the Character Map window for the proper keystrokes, [ALT] Something-or-other in four digits. Kinderspiel, ja? Aw C’mon you’re pickin away at poor little co2. The stuff with magical powers. If you continue down this path you’ll only confuse the folks proclaiming consensus. We could easily get along if the CO2 crowd played by the rules. No lying, no cheating, no obscuration, no hiding data, no manipulation of data, no raising model output to real data status, no ignoring of alternate views, no prevention of publication, no name calling etc etc. I know you are being cynical and a bit sarcastic but these charlatans have caused untold damage to whole economies. Stupid politicians have wasted billions which could have provide real benefits elsewhere. What hurts is that people like Tim Flannery are intelligent enough to realise they have erred but too gutless to say so. When the Chief Scientist wishes we realists would just shut up you know science in this country is stuffed just as the CS should be. As peter Finch said in “Network” “I’m mad as hell and I’m not going to take it anymore”. I’m a human being, god dammit! My life has value!! haha. I have seen Network and it is a great film. Finch’s angry scenes were surprisingly powerful. Sorry to change subject from Climate Change to Celebrity Gossip – although they both seem frequently to gain air time far in excess of their merit! Item of trivia: The first Australian actor to receive an Oscar after their death was Peter Finch for Network, and the second was Heath Ledger for Dark Knight. Oi mate, Heath Ledger was a Kiwi. It didn’t work with Phar Lap, and it ain’t working with Heath. You will just have to make do with John Clarke, OK? What?? Ledger a Kiwi??? Since when?? He was born Heath Andrew Ledger on the 4th of April, 1979, at the Subiaco Hospital in Perth, Western Australia. The Ledger name was well-known in Perth, the family having run a foundry that provided much of the raw material for the famous Perth to Kalgoorlie Pipeline, which ran 557 kilometres east out into the desert and, beginning to pump back in 1903, first supplied the Western Australian goldfields and now served over 100,000 people and 6 million sheep in 44,000 square miles. The Sir Frank Ledger Charitable Trust, named after Heath’s great-grandfather, was renowned for granting funds to the area’s universities, paying for visiting lecturers and scholarships for gifted students. In keeping with the family tradition, Heath’s father Kim, a racing enthusiast, ran several engineering firms in the city, while Heath’s mother, Sally, hailing from the Scottish Campbell clan, was a French teacher. Sounds about as kiwi as Mao Tse-tung, do you want to claim him as well? Charlatans is too polite when applied to those with malign intent. They are far worse than someone who meets that definition: one making usually showy pretenses to knowledge or ability [from Merriam Webster Online]. Why can’t we realize that they intend great harm and are an enemy, then call them what they are? And yes, I know some of them are simply taken in by the fraud and believe it. But this is not just someone selling snake oil to the gullible for profit. They are far worse. They don’t just want your money. They want control of your life. Remember that correlation does not imply causation. Consider the possibility (which I consider more likely, knowing the level of incompetence in the “accepted science”, and that the fundamentally stable Standard Atmosphere model rules, from my Venus/Earth temperature comparison) that the measured “global mean surface temperature” (or GMST) is not what climate scientists claim it to be, but is really just an unintentional proxy for the PDO (in other words, it’s not “global temperature”, but merely an unintended “PDO temperature”, that must follow the PDO by definition, not by physical cause). The Earth’s surface is 70% ocean, after all. Everything, including the GMST “measurement”, should be doubted now. I agree Harry. Temperature of liquid in a container is not at equilibrium with it’s input nor with it’s emissions. What relevance should we even be considering for GMST as indicator for GCM’s, compared to the dominate diver, PDO? This is, on the one hand, a fine observation, and on the other, perhaps misleading. Whether the PDO causes the 60-year oscillation of predominant El Niños and La Niñas or is simply a multiyear lagged and smeared result of them, the point is that we have an unexplained 60-year oscillation. Once that oscillation and its periodicity can be explained, ENSO will take its place as either a cause or an effect (or both) in the doubtless incredibly complex chain of climate change causality. No CO2 need apply. Hi Craig, I agree completely, I have described where heat goes to some degree, and to some degree shown that the huge snowy area of Siberia is connected with some Pacific SSTs. I have indicated that Snow cover may explain some influence of Siberia on some Pacific SSTs, so you could say then I have just “moved the monkey”.. True. I think i have support the idea, that cooling needs a period of more La Ninas than El Ninos, that is, a negative avg. Nino3,4 temperature. This normally comes with cold PDO. And? Well, Now we have cod PDO that do then indicate longer term cooling. If so, this is not in compliance with CO2 levels being the “highest ever”. Another important finding I´d say is that Nino3,4 is much more than a 1-2 lasting effect. This does not explain CO2 or not CO2, but it is relevant to know. For example when Rahmstorf and Foster tries to “correct for ENSO” when just looking at the here-and-now-effect”. Am I reading the graph correctly? That the blue line is a function of temp data a month prior + a simple linear adjustment of HADISST data set? My first reaction is this: surely feeding in the very signal you are trying to replicate would artificially increase your regression fit? How would the formula go with red noise instead of temp data? Would it accurately replicate the red noise? At least need to come up with a better way to measure quality of the fit other than relying on eyeballs; at least confirm that the fit outperforms red noise. ” How would the formula go with red noise instead of temp data? Would it accurately replicate the red noise? The R value (or similar) is not demanded to be 1,00 , especially because there are other mechanisms on Earth than what Nino3,4 represents when it comes to temperature. For example, the Atlantic would pick up a signal too, so what kind of mathematical match do you believe is correct? Honestly i dont think you can answer, and therefor your demand – at least for now – is beyond reasonable allthough you have good intensions. Red noise: If you have patience then im sure you could produce the fig 1 match with red noise. There would be many attempts using red noise between a match as good as the one on fig 1. True I dont know if every 100 red noise attempts would make a similar good match or if every 1000 would. But what is obvious is, that it would be a fraction of red noise attempts that would make a match like the one on fig1. But Again, since we cant expect Nino3,4 to represent all smaller changes in Earth temperatures, we can never demand a much better match than what we see on fig 1, even if every 100 or 1000 red noise attempts could do the same. Therefore, your trying to be “accurate” is not justified, but it would be nice if things where much more simple so we could demand mathematical accuracy just from the nino3,4 signal. We cant. I am not seeking a perfect model, what I am seeking is verification that the performance of the model you are proposing is actually meaningful and statistically significant. An obvious way, to me, to do this is to use Monte Carlo with red noise and see to what extent the model outperforms red noise input. Because of the nature of the model, that it’s output is required as input, I feel that it is necessary to formally measure significance to ensure that the model is actually a performer. I wonder what the graph would look like instead of plotting calcTemp(t)=knownTemp(t-1)+m*HADISST+c you instead plotted, calcTemp(t)=calcTemp(t-1)+m*HADISST+c, where calcTemp(0)=knownTemp(0); if you removed the implicit auto-correction in the model, and only use a single known temperature data point to seed the model, how well it would perform, how significantly would the model divergence be? I think your idea about the Monte Carlo model is interesting, especially as you point because it has output as input. But I cant help thinking: We know that there for natural reasons has to be some oscilations better represented elsewhere than the Nino3,4 area, so how would you ever be able to interpret what came out of such an approach? We would naturally expect a fair but not perfect result, and that is likely what we would get? I have never used the Monte Carlo model, but im only 44, so there is time Can this model be run online with for exmple a delay, so that responces are expected a little later than nino3,4 signal etc? This is a bit chicken and egg and ultimately so what that there are well delineated periods and oscillations where El Nino dominates and then La Nina that are described as +ve and -ve PDO’s? The point is natural variability which operates on a variety of time-scales. Kudos to cohenite for going beyond just saying, “wow, that is good”. I think the last 18 or so months has shown how nuanced the creations of La Nina can be: First in 2010 La Nina was clearly SOI driven, West-East moving warm waters under equator etc. Then SOI faded out in 2011, but PDO, otr lets just sat SST of NE Pacific water cooled strongly and we had cold waters coming down from the North) And now it seems that we have cold water from south the “SPAC” area possibly to reach equator within some months. Thats 3 different origins of cold to reach the equator. And as shown, AO can play a role in the directing of Siberian cold air/water. So yes if you study ENSO with respct to ONE origin of temperature input you can get all sorts of Chicken and egg situations, strange data, because when heat is entering from another “wrong” origin, this wont support a single-point-of-entry approach of heat to the Nino3,4 area. The Nino3,4 area seem to be the fuse through which waters/Surface temperature pass collected from many origins, and therefore we can look at nino3,4 and get a rather good idea of how temperastures evolve. I think that Bob does really excellent work, work that need to be done. Compares of data to tell about what PDO is and is not. And if he had not done these things, others would have to. I just dont allways agree in all conclusions he makes, and I think matters are more complex than to close the debate on Bobs or any other good scientists work at this point. I certainly dont see a settled science on these issues. There are also other piles of work on these matters, for example “teleconnection heat transfer” that heat jumps fast backward (compared to gyre rotation) to explain matters. Im no against such idea, but for now i dont find such a mechanism to be that dominating. One third result you see here and there is the “Re-emergence” of PDO that suggests that PDO signal – when ongoing – seems to be seasonally affected. This supports that snow-cover over Siberia could be important. For example, in the analysis of Pacific temperature patterns I have not seen Siberia play a significant role. Siberia is HUGE, Its snowy and winds from Siberia points directly into the Northern Pacific. How can anyone feel that issues on Pacific temperature patterns are even remotely understood without including Siberia significantly in the mechanisms ?? Siberia does not seem to have many stations measuring temperatures, 5 to 8? very sparse for determining trends, or anything else. Just a quibble, as I agree that Frank is onto something real. Oh there is many more than 5-8 temperature stations in Siberia, and they hold really many long series, so its really good to work with. Its even possible to get hands on more series. But at the time I was making this article Appinsys was down, so I used Crutem3 via KNMI. Is the area I show just 5-8 stations in CRUTEM3, is that what you say? Anyways, “Russia” has complained to CRU about their warm trended choice of stations in Russia, but since i work with detrended data, this issue is not present too much. The specific peaks and dives show a remarkable connection with nino3,4 and unless this is a “coincidence” i think that Crutem3 is ok for this use. But perhaps GHCN would be slightly better. I think the oscillation angle is bull crap as it gives scientists an excuse not to study the planets mechanical components that they really have no clue into what is going on. And yes, the oceans are our planets temperature driver in where we receive most of our evaporation and precipitation from. Why our planet is not 400 degrees Celsius. Feel free to ignore as I am used to that but here is my studying physically of this planet from salt changes to circulation. What I current is trying to recreate is the velocity differences in the planetary tilting. These are all physical components and not theories. Im not sure what oscillation you think of, is it the pendulum tendency between Siberia and Nino3,4? But these are there in data..? Yes, water stabilizes temperatures a lot, you are correct. But sometimes somthing drives these stable temperatures a little up and down, and Clouds, and snow+Ice cover appears reasonable drivers due to albedo? heat to some degree may be produced in the process of heat transfer between the Pacific and Siberia. Have fun selling that one. Each time heat travels between the Nino3,4 area and Siberia, it has an effect on how fast snow melts in Siberia. This effect is to some degree fairly well supported by fig 8. Is that hard to sell? Probably yes, but im not sure that the problem is about science. im not sure that the problem is about science. Well said. Dogma is very difficult to overcome- sometimes deaf, dumb and blind to any other explanations which don’t fit their predetermined and tenaciously defended paradigm. Dismissal is the first tactic, followed close at heel by derision, then finally aggression. Don’t let it bother you, Frank, it means you have made some good, inconvenient points challenging their belief. Beags, you’ve done it again. It’s the detail that does it. Like in the 2nd frame, could that be George Monbiot flapping skywards? We shall never know. Just to nitpick… There’s a few places where “warmed” has been written in place of “warned”, hopefully that was intentional but I personally thought it was awkward. Also if the pig in the bathtub had been in a pork barrel, that would have just added that little extra icing on the cake. The walking windmills, just genius. by Hunzicker and Camill. This manuscript has been in review for 14 months. Can you indicate when I can expect these materials? Thank you….’Warmed’ is intentional. A bit awkward perhaps, but they started it. “Non-equilibrium thermodynamics is a fundamental description of the Earth system and can be captured in a simple 1st order difference calculation. dS/dt = Ein/s – Eout/s – where dS/dt is the change in energy storage in the system and Ein/s and Eout/s are the average energies into and out of the system over a period. Within the simple global overview are of course myriad – and powerful – processes through which energy cascades in the deterministically chaotic system that is the fundamental mode of operation of Earth’s climate. We are used to thinking of the oceans as layer of warm water over cold water separated by the thermocline – the depth at which the rate of decrease of temperature with increase of depth is the largest. In terms of energy dynamics – this seems relatively arbitrary. The oceans heat as a whole and cool as a whole – but within this there are hydrodynamical and atmospheric processes that influence both local and average rates of warming or cooling. ENSO is a key process involving upwelling in the eastern Pacific in a La Niña and – when the trade winds falter – the flow eastward of a pool of warm water that had been piled up against Australia and Indonesia. The cold surface of the central Pacific in a La Niña loses less heat than the warm surface in an El Niño – remembering the net direction of energy flux. There are in addition cloud feedbacks in ENSO that again change the planetary energy dynamic. Secondly – that a La Niña cools the planet and an El Niño warms the planet – suggesting both a contribution to warming between 1977 and 1998 and a cooling influence for 20 to 40 years from 1998. Unless we can get this from an equation of maximum entropy – we are as far from the truth as ever. Relationship of Siberia in this is not the pathways of heat into Il Nino it creates, but the lapse rate of cascades which allow the Il Nino energy to leave the atmosphere, a warmer atmosphere from Siberia in the Northern Pacific will slow the lapse rate of Il Nino dissipation and warmthe planet. The pendulum theory part misses the planetary tilting and angles of solar radiation that comes in at different angles. Scientists have made huge errors by following a single calculation for the whole planet which ignores and misses many factors. Where did they get that single calculation? If they used averaging, then the planet they are studying is a cylinder and not an orb. If using the grid method, then there are 129,600 grid squares. Many do not have weather data so, how is that factored in? Smoothed from other grid squares? Studying up to 300 years out of 4.5 billion years is cherry picking rather than looking at history and following changes of geographical changes. Why is water loss NOT included? Because scientists have no clue how to figure that one out. Yet if you follow the residue of salt, it does give time frames by how old the oldest salt is to the highest point of oldest recorded salt. So far as I have found, it is far easier to study temperature data than actually following planetary evidence. Yet temperatures do not include evaporation/precipitation, planetary water loss, planetary slowdown, velocity differences, angles of solar penetration/absorption/deflection, planetary tilting, salt changes,shape of our planet, differences in distances from sun, etc. A cylinder is NOT what our planet is yet models treat it like it is. Have you tried putting the calculation back from the calculations of abnormalities? It gives a false reading of the whole planet having the abnormality when only certain areas have at that specific time. Circulation of heat and cold is far from climate science lists of understanding the planet by way of temperature data. Hi there, it looks as if you have a site that per definition doesnt agree with anythin on Jo-san´s site, it appears to be more like “how can I attack this” than a real attempt to investigate her nice truth seeking work. Did you forget to read the article? Whatever heat or cold flowing through the Nino3,4 area this can obviously be affected by any heat source, CO2, Sun or what ever during the approx 3 year long cycle Siberia-Pacific. I show that snow cover changes in Siberia seem to have a great effect. But i do not rule out that Sun, Co2, Clouds, Aerosol may affect this snow cover in Siberia or any where else. Honestly, my article is rather close to neutral in the climate debate, absolutely one purpose only: To understand. The article does support that Cold PDO means cooling, but It does not rule out that cold PDO may be affected by solar changes or anything else. But there is a problem: Now we have a cold PDO but still rising CO2. This does not support that CO2 drives PDO. Or you perhaps think so? Join the debate here at Joe Novas, unlike several Alramist sites, Jo´s site it open for “dissenting” voices. I admire you for trying to understand the entire breadth of climate science all by yourself. If you manage this, it’ll be a feat no one else has achieved. Personally, when I’m trying to learn about something, I ask someone far more knowledgeable than I whether I’m on the right track. As this is ‘close to neutral in the climate debate’ surely you should ask those at skeptical science for some balance. And also for some responses from ya know, actual scientists. So either a sceptic can be proven wrong or if not, then hes just wrong because others must know better..? It doesn’t mean that a sceptic like me is something extraordinare, it just means that “climate science” is in a very unsettled level and everywhere there are open questions. It is this idea/Paradigm that is questioned in fig 1. Frank, Do you see any connection between Nino3,4 temperatures and the Humboldt current? There is a huge current flowing through Drake’s Passage south of Tierra del Fuego. The Humboldt sort of splits off from this. If there was volcanic/seismic activity in Drake’s Passage one could speculate that the Coanda effect could vary the Humbodlt current and affect the Nino3,4 temperatures. Interesting results; thanks for all your work — and for publishing it. Bob Tisdale has done a huge amount of research and analysis on the effects of ENSO on worldwide ocean surface temperatures and (thus) weather/climate, time lags, the odd heat anomaly, and so on; I hope you’re acquainted with his work. The Kuroshio Extension, a northeastward current carrying heat from the Pacific Warm Pool into the Central North Pacific — effectively providing a lagged N Pacific reflection of an ENSO event — probably has some effect on Siberian vs Alaskan temperatures. Bob has an interesting post currently on WUWT; his own blog is at bobtisdale.wordpress.com. You may want to communicate with him; a cooperative paper between the two of you would be fascinating. Hi Craig, thankyou for comment! I have read several of Bobs writings on PDO etcetc. Fine work, No doubt some inspiration comes from those articles. I agree in most his conclusions, but perhaps not all. Thats how it is in with scientific opinions. I think to understand why this pendulum like occurence of heat between the Nino3,4 area and Siberia occurs, it would be interesting to explore not only how heat enters the Pacific from Siberia, but also where heat goes from the nino3,4: This I think bob has studied a lot. Frank, have you seen this site? I’ve heard you are in Denmark, so probably you have. Lots of old temperature records. Maybe you have used these for RUTI already?? By The Way… I don’t think you need to collaborate with Bob Tisdale since we have enough groupthink in the global warming argument already. But if you think you can both change each other’s perspective on how to understand the truth and ambiguity of historic climate change… go for it. Hi Andrew, and thankyou for comment! Rimfrost.no : I checked out a row of stations i usually use to evaluate if data are original or (very) adjusted, and I found results to be adjusted. However, since you brought it up, I have noticed that for some Metoffices/countries here and there seems to be useful stuff, so thankyou for mentioning Rimfrost!